Visit Hampton Yacht Group’s 2018 Intrepid 410 Evolution at the San Diego show! 2018 Intrepid 410 Evolution – Legendary performance with comfort and amenities for the whole family. Powered by Triple Yamaha 350s. Below she boasts a beautiful teak interior with queen pedestal bed, dinette, galley, and head with stall shower. 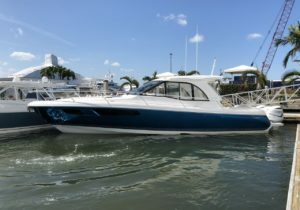 Features include diesel generator, air conditioning, sunroof, power awning, joystick docking, bow thruster, and 16” Garmin displays, radar, auto pilot. Contact Hampton Yacht Group (949)515-0006.